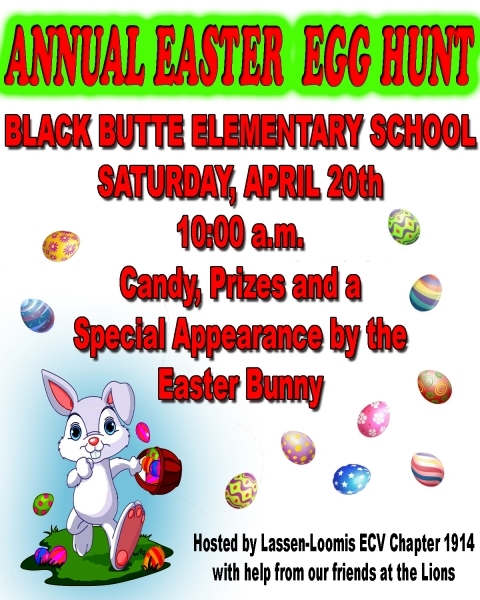 Come enjoy the Annual Easter Egg Hunt at Black Butte Elementary School on Ponderosa Way in Shingleyown on Saturday, April, 20, 2019, startinging at 10:00 am. There will be candy, prizes and a special appearance from the Easter Bunny. The event is hosted by the ECV Chapter 1914 with help from the Shingletown Lions. For more details, please call Mike at (530) 945-6879.